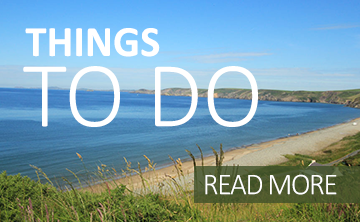 Some questions answered about caravan ownership on one of our parks at Newport Bay, Newgale Beach or Castle Farm (Dinas Cross). We are open from March 1st until the end of November unless otherwise indicated. Can we visit the caravan when the park is closed? Yes. Since the gates will be locked, and for security reasons, please call us before coming. It is not possible to stay overnight however. Water and electricity may not be connected. Can we rent out our caravan? We do not allow business hire, but we do not mind you charging family, friends and people you know . How long can a caravan stay on the park? New holiday caravans purchased from us come with a license for 15 years, residential specification models for up to 20 years. This is a family owned business, and has been for nearly a 100 years. Current family members are Leonard and Beatrice Merrick, Ian, Samantha, Andrew and Kate. No. Local shops and pubs and restaurants are nearby. How far is it to the coast? We cannot get much closer! The parks at Newport and Newgale extend to the high-water mark. Castle Farm is a brief walk from small coves. How do I go about selling my caravan? We can make you an offer of purchase, or sell it for you on the park depending on condition. If sold to stay on the park there is a commission of 15%+VAT on the sales price. All sales on the park come through the park office. Do I have to cut the grass around our caravan? No. We look after this, but we are also please when owners take an interest in the area around their caravan; plants, shrubs, etc. Feel free to talk to us about your ideas. Yes. A contract is now necessary if you wish to buy and keep a caravan on our parks. We use the trade body approved model contract which is in plain English and offers security and peace of mind to all involved.